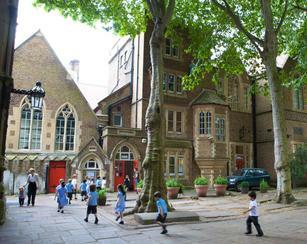 St Mary Abbots School was first endowed by Roger Pimble who, in 1645, left two houses in High Street Kensington "for the maintenance of a free school for poor-men's children in the same town to be taught". Over the years other benefactors added their legacies and gifts. In 1707, the Church increased its endowment to the Charity School so that 30 boys and 30 girls could be clothed and taught "needful learning and work" and put to suitable trades. Queen Anne also gave £50 per year for the use of the children and Prince George of Denmark donated £50 per annum for the Schoolmaster's salary. A School was built about 1709, some sources say 1713, on the site of the Old Town Hall (demolished 1982). It was a red brick, two-storied building surmounted by a heavy square tower with apertures for bells. On either side of the tower, facing up and down the High Street were two figures, one facing towards Hammersmith, of a Charity Boy with a pen and scroll inscribed "I was naked and ye clothed me"; the other, looking towards the City, of a Charity Girl holding a Prayer Book. There were two rooms, one for girls, one for boys, a hall and a kitchen. At the end of their schooling, the children were apprenticed or sent into service, each with a copy of the Bible, "The Whole Duty of Man" and one guinea (£1.05). In 1750 arrangements were made for 12 pauper children to live in the school but by 1809 boarders were no longer taken. Ten years later, after an enquiry into the charities educating the poor, the School was considered large enough to take 500 children. However, by 1860 the building was in need of repair and the High Street was thought dangerous for children considering the amount of horse traffic using it. Thus a house was bought in Church Court and a girls' school room was built. Between 1863 and 1872, other properties were bought and new schools built for boys and infants. The Charity figures were retained and placed over the north-facing door. These buildings were remodelled around 1904 and the three teachers' residences were appropriated for other purposes, i.e. a staff room, a house for the School Keeper and another for the Verger. St Mary Abbots now enjoys a secluded position away from the noise and bustle of Kensington High Street. It is a Voluntary Aided Church of England Primary School in the Diocese of London for children whose ages range between 4 and 11 years. There is a close connection with the Parish Church, which the older children attend each Thursday at 9.30am for the School's Eucharist Service. This is led by each class in turn, and is open to the public. Parents and friends are welcome to join the School in worship at St Mary Abbots Church whenever they can. All the children meet daily for worship in school, and although the School is traditionally Anglican, the teaching of all major world religions takes place together and an awareness of other cultures and festivals is nurtured. The School's intake reflects the cosmopolitan nature of Kensington and we are fortunate to have a harmonious mix of children from many different countries and world religions. Respect and tolerance for each other is encouraged in order to develop a greater understanding of the multi-cultural world in which we live. Over a third of the children are second or third language learners and there are between 20 and 25 languages represented.